MOUNT VERNON, Va. — A long-awaited review of Metro’s leadership and finances by former U.S. Transportation Secretary Ray LaHood has not reached any conclusions on how much dedicated money the transit system needs to recover from years of neglect or how that money should be raised. 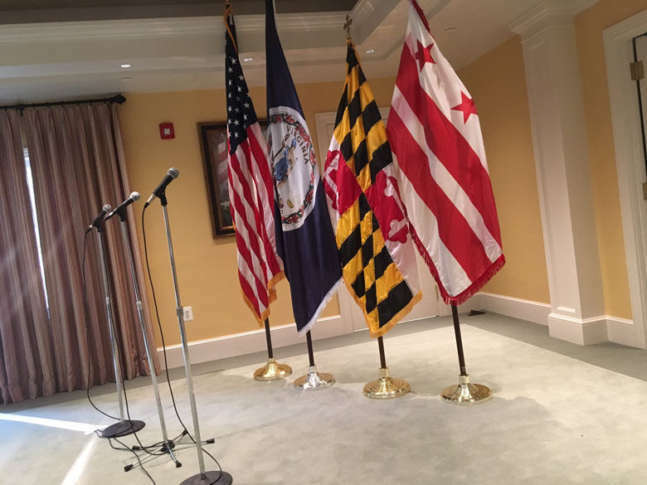 LaHood told D.C.’s mayor and the governors of Maryland and Virginia the absence of news on Monday afternoon, which leaves the region without crucial agreement as potential deadlines near. The report — a written version of which will be finalized by October — does recommend that a temporary four or five member board take control of Metro to determine further funding steps among other things. The report also suggests the region address Metro’s underfunded pension plans after years of deferred contributions. While Virginia Gov. Terry McAuliffe, Maryland Gov. Larry Hogan and D.C. Mayor Muriel Bowser each agreed in broad strokes on the need to turn Metro around, they did not agree on key specifics like what kind of tax might be used to fund additional improvements for the system. The divisive issue wasn’t discussed in either Metro General Manager Paul Wiedefeld’s or LaHood’s presentations, Bowser said. That leaves the region in largely the same long-term struggle that it has faced for years, as the crucial General Assembly sessions in Maryland and Virginia inch closer this winter. Wiedefeld has warned that additional funding plans — sales tax, property tax or otherwise — must be in place by next summer to avoid either more significant service cuts and fare hikes or a significant jump in tax contributions from local jurisdictions. A Metropolitan Washington Council of Governments panel led by Fairfax County Board of Supervisors Chairman Sharon Bulova is scheduled to report its strategy next month for workable dedicated funding for Metro, but that panel has also struggled to reach an agreement on details. Bulova and McAuliffe talked for about an hour Sunday about the issues, McAuliffe said. McAuliffe leaves office due to a term limit in January, but he still hopes to submit recommendations to the General Assembly ahead of the legislative session. Bowser, Hogan and McAuliffe each endorsed the concept of a temporary, smaller board as a way to achieve solutions for Metro such as some sort of dedicated funding. However, there are questions about how such a temporary board could be established under the existing Metro Compact that governs the system, Hogan said after the closed-door meeting. LaHood recommended dodging any changes to the compact as part of the temporary board setup to avoid delays in implementing what he has suggested as a temporary governance switch. Wiedefeld, high-level staff and cabinet-level transportation leaders from the three jurisdictions attended the meeting at Mount Vernon where the governors and the mayor also discussed Chesapeake Bay cleanup efforts, the opioid crisis and a September joint trade mission to Canada. The smaller board, likely with one expert appointee each from the District, Maryland, Virginia, the federal government and a fifth independent chairman, would be different from a federal control board that some business groups had suggested. Under LaHood’s recommendations, the temporary board would sort out how much each jurisdiction should pay for Metro, including the federal government. In his view, the smaller board would also allow more flexibility for Wiedefeld, who he said he has heard only praise for from leaders across the region. Metro’s hourly labor costs are in line with other systems across the country, LaHood’s presentation concluded. Virginia Transportation Secretary Aubrey Layne said that could be key to convincing some lawmakers in the Republican-led General Assembly to allow for more funding for the system while collective bargaining agreements remain in place. Metro’s labor costs per rider though have been rising over the last few years as ridership cratered due to service disruptions, unreliable trains and significant track work meant to address those issues.